Airbnb announced a business travel program on July 20. The program will allow business travelers to charge business travel lodging expenses to employers instead of submitting expense reports for reimbursement. Company dashboards include upcoming trips, interactive maps and more. Airbnb doesn’t seem to be slowing down in the midst of controversy. Instead, the San Francisco-based, short-term rental company is taking the industry by storm with its July 20 announcement of the expansion of its Business Travel program. The Business Travel program was officially launched last July. Since then, the company has seen a whopping 700 percent growth in that sector of the company. More than 250 companies have joined the program during that time, including Google, SoundCloud, TBWA and Twilio. Now, these companies and more are able to access a suite of tools slated to make the process of obtaining and financing business travel more streamlined. 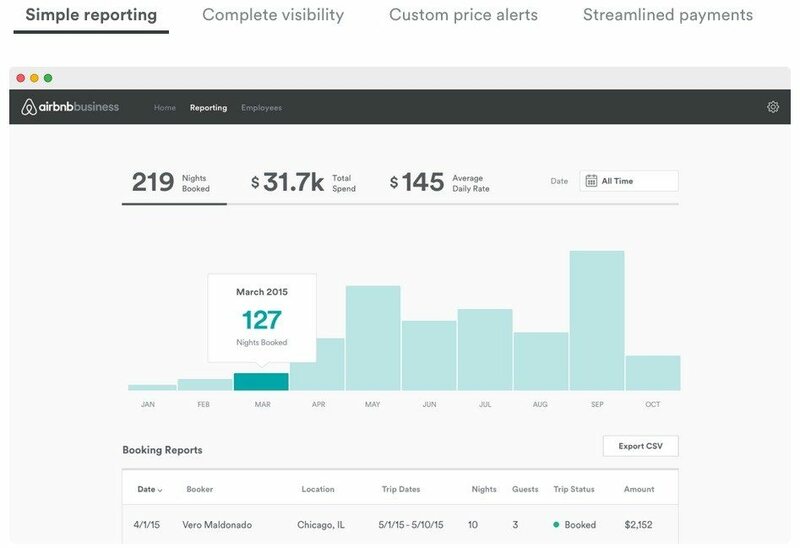 Financial data reporting, itineraries, billing and more are now accessible for companies using the platform. The product is free of charge for companies that use Airbnb for travel. Companies enrolled in the program receive a coupon code, which simplifies the booking process. When using the platform for booking travel, employees set the dates and the location they are looking to stay. They then use the company code at checkout; the reservation will be made, and the charge will go directly to the company, not the employee. This helps to eliminate the back-and-forth paperwork of expense reporting. This three-pronged product features an activity tab, a reporting tab and a tab for employees. Whoever is in charge of maintaining a company’s travel can view everything from upcoming trip dates and locations, how many people in the company are traveling, an interactive map, approved and pending requests, and more. Even while Airbnb is expanding its offerings to businesses, organizations throughout the world are still pushing for regulation against the illegal operation of short-term rentals. Because there is a whole sector of industry geared toward business travel, most commonly referred to as furnished apartments, this expansion could very well put Airbnb in hot water.